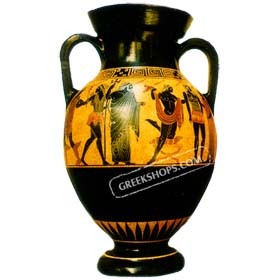 Hand-made ceramic copy of a Greek Black Figure Amphora - container used in the ancient Greek world as a means for transporting and storing grapes, wine, olive oil, olives, grain, fish, and other commodities. Different designs painted on front and back depicting mythological scenes. See additional photos for details. A beautiful additional to your household, or a wonderful gift. Approx. 30 cm in height (11.8"). *This is a hand-painted reproduction, individually signed by the artist. Artistic styles may vary slightly.